You may have mad skills and an intense desire to do the best job possible with them, but until you land the job, those skills aren’t being put to work. To get your foot in the door to the interview, where your passion for the position can shine through, you should use a professional resume template. The honest truth is that if you are looking for a respectable job with a decent salary and benefits, you have to stand out from all of the others who want those same things. Minimal effort isn’t going to cut it – your resume has to be error-free and content-full. The good news is that there is a professional resume template out there to help you once you know what you need. The better news is that everything you need to know to create a winning resume is right here! Writing a professional resume may seem like an intimidating task, but when you break it into small sections, it is perfectly manageable. Because it is such an important piece of your potential career, it’s crucial that you take it seriously. If your resume contains errors or appears amateurish, you probably will not get called in for that coveted interview. An unprofessional resume uses fonts that are considered childish, like Comic Sans, or that are difficult to read, such as any cursive styles. Don’t forget to proofread, use Grammarly and online editing tools, or have a professional editor read through your resume. An amazing list of skills and qualifications is not as impressive if you can’t use the correct version of “your” or “to,” for example, or you are missing punctuation at an important spot. Only include skills that are relevant to the job you are applying for. Winning your high school baking cook-off doesn’t help you if the position you want isn’t related to anything culinary. Don’t use inconsistent formatting, random bullets, and mixed fonts and headings. This makes your resume look sloppy and makes you look unprofessional. Now that you know what to avoid, you can focus on putting together a polished, clean resume full of all of your incredible skills and selling points, one section at a time. Picking the best type of resume to showcase your top qualities will help you easily transfer your content into the template. If you don’t have a lot of experience, you wouldn’t want to use a chronological resume, for example, since that highlights your past jobs more than skills. 1. Chronological – The most common type of professional resume template is the chronological one. This resume lists your work history in time order, from most recent to earliest jobs. It gives employers a quick glance at your employment history and lets them look for red flags like any glaring gaps or – sometimes worse – your fast job turnover. You can use this type of format if your work history is strong, has skills that align with the position you are trying to obtain, and you don’t have many lapses between jobs or multiple jobs in a short period without a good, explainable reason. 2. Functional – A functional professional resume template will draw the focus away from your employment history and onto your skills and experience. Instead of targeting the dates you were employed, employers can quickly see your strong talents. Use this resume template if you have multiple gaps in your work history, are trying to transition into a career that you don’t have a lot of experience in, or you have an assortment of jobs without a clear connection. 3. Combination – As its name implies, this type of professional resume template lets you create a professional resume that equally focuses on your skills and your work history. Because it is flexible, you can tweak it each time you apply for a job based on the opening you are looking to interview for. This resume is great for people who want to quickly reinforce to the hiring manager that they are a solid, skilled employee that stands out from the other applicants. 4. Targeted – When you create a targeted resume, you are specifically customizing it to meet the criteria of the job you are looking for. Each part of it – the objective, qualifications, and educational experience – is specifically written to show your skills and experience with the position you hope to obtain. 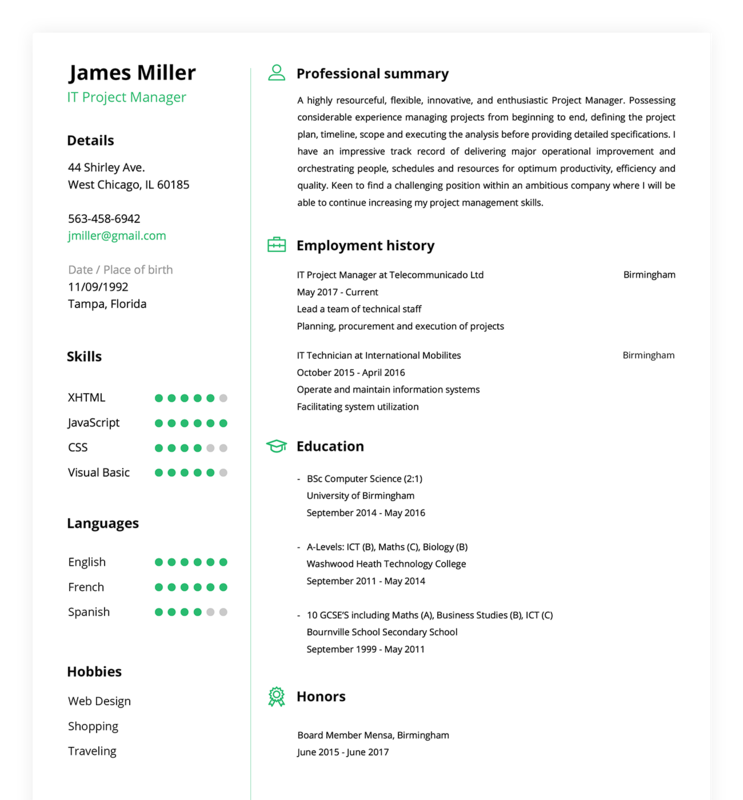 Because of the time-consuming nature of this resume, it’s best to use this format if you are determined to land a job in the field you are targeting. It’s important to be accurate and analyze the job description to mirror the necessary requirements. Your resume needs to have clear alignment, bullets, and font. Professional resume template examples will tell you to use a font size between 10 and 12 and a clean, legible typeface such as Arial or Calibri. The jury is out on Times New Roman. Some newer guidelines suggest that its time has past, while others still say it is acceptable. Margins should be no larger than 1 inch on all sides, but this gives you a little wiggle room when it comes to the length of your resume. The general rule of thumb is preferably one page, but absolutely no longer than two. If you can adjust your margins slightly, you may be able to fit everything on one page. Keep your formatting consistent. Use bullets, but be sure they are the same throughout your resume. Use headings for each of the sections, but bold or italicize them consistently, as well. The human eye generally scans for information through small chunks of text. Because of this standard process, you should use only a few lines of text per idea and streamline it to only the most important information. Use action words to make the main skills you want to stand out really attract the reader’s attention. Heading – This is the part that identifies you and tells the employer how to reach you. It should be easily found at the top and include your name, a current address and phone number, and your email. Summary of Qualifications – This section highlights your main achievements and is a short overview of your qualifications. Experience – Here is where you will list your work history, including dates and skills learned, unless you are completing a functional resume. Education – You don’t have to go all the way back to your high school graduation if you have an advanced college degree. However, the most recent education accomplishments should be included here. Skills – While you want to ensure that in your “experience” section you insert the skills you learned on those jobs, this section is for other relevant skills that may not have been included. Things like Office, Adobe, Drive, or other computer program proficiency, first aid certifications if relevant, and other useful skills that may not have been included or that you want to highlight can go here. With these five main sections, you can break your document up into manageable parts and then employ the rest of our tips to create a professional resume. Get creative by exploring some professional resume templates that are unique. It’s a world of technology out there now – resumes don’t have to be computer-generated and paper printed anymore. If you are applying for a job where it is important to show off your skills in technology, try a video resume. This type of resume also works for art professions like photography, where you can use an online portfolio to showcase your work. Infographics, your photo, and other add-ons make your resume different from traditional basic resumes. If you are emailing your resume, you may want to link to some of your work if you have anything available online. Even if you have to go the regular paper route, you can still stand out simply by having the correct formatting and proper grammar and mechanics. However, don’t try to stand out by putting your resume on colored paper. Cream or white are still the way to go. Any errors on your resume can mean that all of your careful work gets deposited directly in the recycle bin. If you are confident in your English skills and your proofreading, read it and read it again. Then ask someone else who is just as competent or even more so to check it for you. Resume writing is a popular business. There are many people out there, from career counselors to freelance writers, who can help you put together and perfect your resume. They can show you how to create a professional resume template, or, if you would rather pay a professional, they can do it for you. Whichever way you go, don’t underestimate the importance of your resume. A resume with errors in formatting or grammar is an almost guaranteed rejection, but the right professional resume template with the right words and formatting can land you that dream job interview.